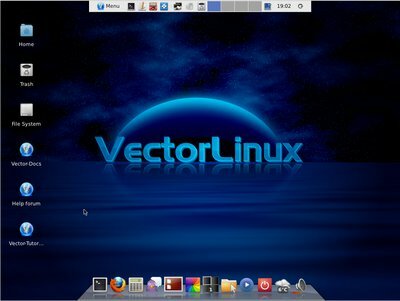 VectorLinux is a fine Linux distribution originally based on Slackware. A new version of VectorLinux (version 7.0) has been released after a gap of 2 years. A notable feature of VectorLinux is that it is a complete Linux distribution. DVD playback, Audio and Video codecs, Multimedia and Java plugins are installed and working out of the box. This means the user need not go to the trouble of installing the codecs prior to watching a movie or listening to music. Wireless networking has been extended with updated drivers and firmware. The default desktop in VectorLinux 7.0 is a customized Xfce-4.8. However, Fluxbox is also installed as an alternate desktop. Linux kernel has been upgraded to ver 3.0.8. VectorLinux Std Live which is a LiveCD. On the applications side, VectorLinux has no dearth of useful software. Graphics suites like GIMP, Inkscape, and Shotwell are installed. VectorLinux comes with a choice of 2 web browsers namely Firefox and Opera. Abiword and Gnumeric are installed. Mplayer, Xine, and Exale allow you to play most available media formats. Pidgin and XChat are present. And Brasero can be used to burn CDs. Click here to download VectorLinux Standard Gold Edition or Click here to download the VectorLinux Standard LiveCD. You may also read the full highlights and the release announcement of VectorLinux 7.0. A 64 bit version of VectorLinux 7 (currently in beta stage) is also in the offing.